(CNN) -- Two-time defending champion Jelena Jankovic is through to the third round of the clay-court Rome Masters, but she was made to battle before defeating Argentine Gisela Dulko in straight sets. 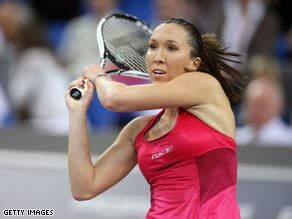 Third seed Jankovic took over two hours before reaching the third round of the Rome Masters. The third seed, whose match was delayed by heavy rain, took over two hours before eventually prevailing 6-3 7-6 -- gaining revenge for her defeat by Dulko in Miami last month. The Serbian former world number one will now meet Kateryna Bondarenko, after the Ukrainian saw off last year's beaten finalist Alize Cornet of France 6-4 6-1 in the only match to be completed before a three-and-a-half hour rain delay. Jankovic's match looked poised to go to three sets, but she saved four set points on her own serve at 5-4 in the second before the heavens opened to delay play. Top seed and world number one Dinara Safina also progressed after overcoming a shaky start to defeat Virginie Razzano of France 7-6 6-1. Meanwhile, second seed Marin Cilic of Croatia and fourth-seeded Czech Tomas Berdych were among the opening round winners in the BMW Open event in Munich. Lleyton Hewitt is also through to the second round of the clay-court event, with the Australian becoming only the third active player on the ATP Tour to reach 500 victories when he saved two match points before beating Philipp Petzschner 6-2 6-7 7-6.